Think about two real-life women who get Invisalign at the same time. They have issues with their teeth that are fairly similar— some crookedness, minor bite problems. They are using the same product, purchased at the same time, and their treatment plans look very much alike. Yet they get two very different results from the treatment. Find out why Invisalign works for some people and not others. The first woman, Mrs. A, wears her Invisalign trays all day and all night. She only takes them out for half an hour or forty-five minutes each time she eats a meal. She brushes her teeth and flosses after eating, before re-inserting the trays. The second woman, Mrs. B, keeps losing her Invisalign tray. She takes it out, sets it down, and then can’t remember where she put it. Sometimes days go by before she finds the tray again. A couple of times, she loses the tray entirely and has to go back to her dentist for another one. When she does have a tray on hand, she does not always wear it, even if she isn’t eating a meal. After a few months, the two women compare results. Mrs. A, who wears her trays all the time, is noticing significant changes in her teeth. They are visibly straighter, and her smile appears far more attractive than before she started the treatment. She has gone through seven trays, seven different phases of treatment, and she has just three more to go in order to reach her goal. Mrs. B, however, is seeing no results. Her teeth are just as crooked as ever, and she is still on her very first tray. What’s the difference between these two women? Consistency. One of them follows the directions of her dentist, using the Invisalign trays as recommended. She is dedicated to seeing change, so she takes action and follows through, even when it isn’t convenient or comfortable. In contrast, her friend Mrs. B is haphazard in her habits. She doesn’t follow the instructions given by her Invisalign provider. She has no plan or schedule for wearing her tray, and she hasn’t designated a spot to keep the tray so she doesn’t lose it again. At Orchard Scotts Dental, we are recognised as one of the best providers of Invisalign in Singapore. We’ll carefully evaluate the situation with your teeth and recommend a course of action that should give you the smile you want. You’ll even be able to see a digital rendering of the smile you could have by the end of the treatment. In addition, we’ll provide you with all the tools and techniques you’ll need to wear and maintain your Invisalign trays correctly. 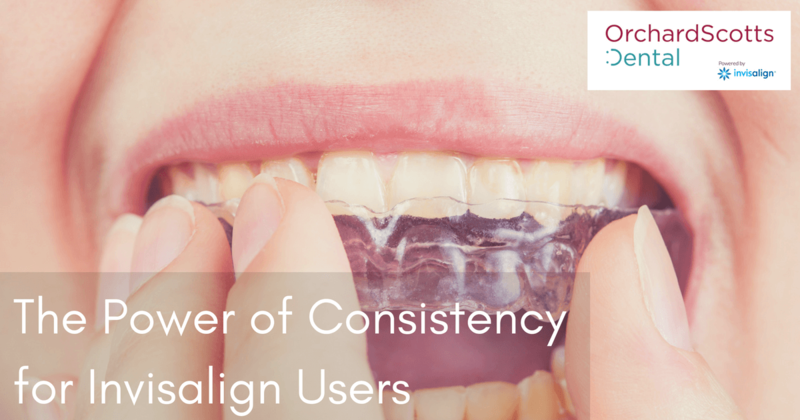 A successful Invisalign journey depends on partnership. At Orchard Scotts Dental, we provide customised trays that will gradually, gently move your teeth into the right position. We offer support and instruction so that you know what to do. That’s our part of the deal. You can even opt for teeth whitening during your Invisalign treatment. If you wear your trays consistently, clean your teeth thoroughly, and come in regularly for your checkup appointments, you should begin to see progress soon. Repetition, dedication, and maintenance is crucial if you want the end result— the beautiful smile that you’ve dreamed of having.